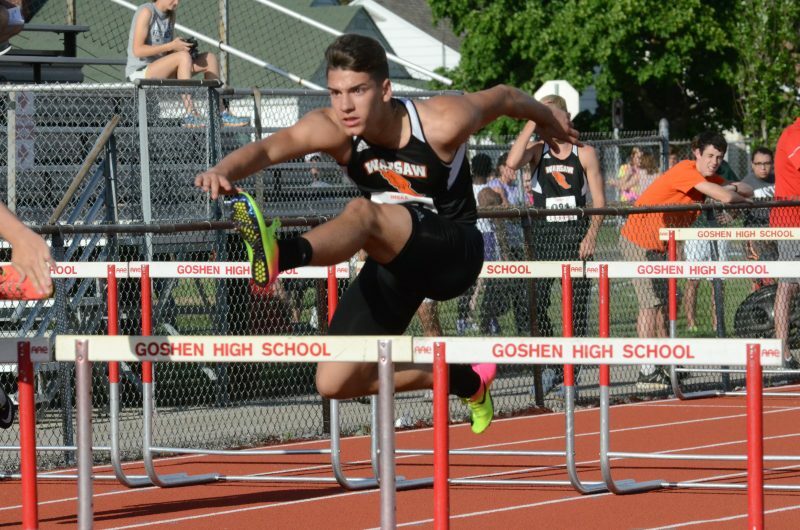 Kendal Miller competes in the hurdles for Warsaw in the Goshen Sectional Thursday night. 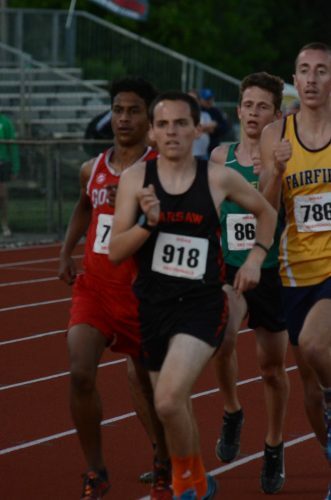 GOSHEN – The Warsaw boys track team definitely faced a test in its quest for yet another sectional championship Thursday night. The Tigers rose up to the challenge in fine fashion late though to ace their postseason exam. Warsaw used a late flurry to score a plethora of points down the stretch to secure a seventh straight sectional crown at the competitive Goshen Sectional. The Tigers tallied 101 points on a warm and windy evening at Foreman Field to turn back the host RedHawks, who were runner-up with 94 points. Elkhart Central and Northridge each scored 78 points to tie for third place. Zeb Hernandez won the 1.600 and was second in the 3,200. The top three finishers in each event Thursday night move on to the Kokomo Regional on May 25. Warsaw, who trailed Goshen, Elkhart Central and Northridge in the team scoring most of the night, put an exclamation point on the title at the end. The Tigers won two of the final three events contested on the track as junior Tristan Larsh captured the 200 in 22.79 and the 4 X 400 relay team of seniors Rane Kilburn and D’Andre Street, junior Ridley Lemon and sophomore Alijah Wade won the last event of the evening in 3:27.28. In between, Zeb Hernandez and junior Lucas Howett gave the champs huge points with a 2-3 finish respectively in the 3,200. Warsaw coach Matt Thacker, who saw his program win its 28th sectional overall, had a lot to say about the latest. The Tigers truly though had plenty of fine efforts when it was all said and done. 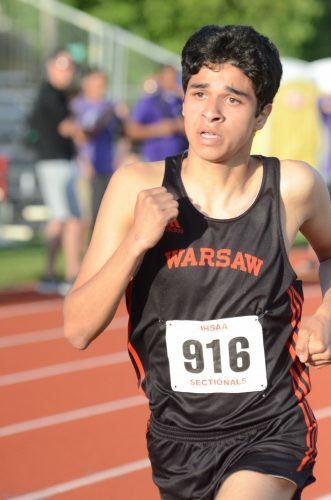 Sophomore Hernandez won the 1,600 in 4:32.33 after being sectional runner-up a year ago. 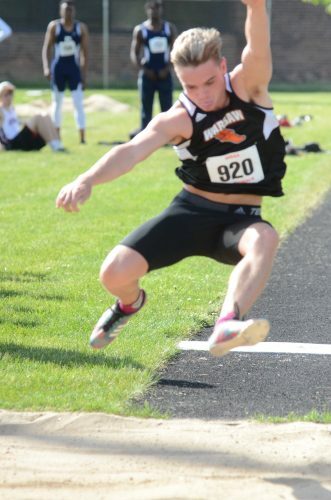 He was also runner-up in the 3,200 after claiming both titles at the NLC Meet last week. The 4 X 100 relay team of Kilburn, Larsh, Wade and junior Will McGarvey tied the school record with a championship effort of 42.63. Larsh was second and Kilburn third in the 100 to move on to the regional round. Junior Dalton Smoker was second in the shot put. Rane Kilburn had a huge night for the Tigers. 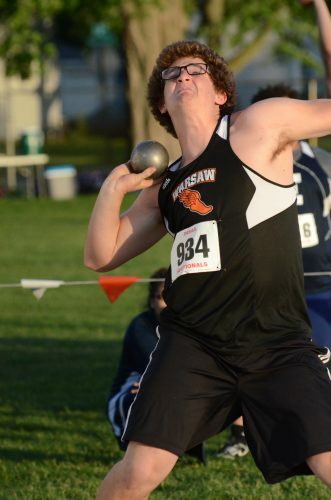 Warsaw also got key points in both hurdles races from junior Kendal Miller and junior John Svinarich placed in both the discus and shot put events for the champions. Kilburn was also fifth in the long jump. Also scoring points for the champions was the 4 X 800 relay team of Justin Fleming, Trent Shepherd, Xavi Ramierex and Taylor Mills with a fifth-place finish. Fleming was sixth in the 800 with Lemon eighth in the 400 and Nicholas Bazzoni eighth in the pole vault. Thacker, whose team lost a strong senior class from last year’s team that won the sectional by 42.5 points over Goshen, found plenty of positives. “We have great kids and great assistant coaches and we were able to put it together when we had to tonight,” Thacker said. “When it came down to it they stepped up. “It was awesome to see the 4 X 100 tie the school record. That’s pretty special. In the 4 X 400, Alijah Wade who’s a sophomore wanted the anchor leg and he held off a great runner in Ben Zuercher of Northridge. That’s cool to see. We got big efforts from Zeb and Lucas in the 3,200 and two big places in the shot put by Dalton and John. “Tonight was a great learning experience for some of our younger kids. That got really valuable experience competing in a big meet. Dalton Smoker was second in the shot put. Lucas Howett was third in the 3,200.